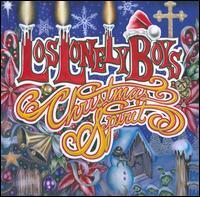 It has become patently obvious that San Angelo, Texas’ Los Lonely Boys have arrived at their true mainstream place in the musical order when they can release a Christmas album on Sony. And what’s not to like? Everything the brothers Garza play is infected with pure bluesy groove and roots rock verve. The ten songs here are Garza-ized takes on Christmas standards: “Jingle Bells,” “Rudolph the Red-Nosed Reindeer,” “Away in a Manger,” “Feliz Navidad,” “Santa Claus Is Coming to Town,” “Carol of the Bells,” and “Silent Night.” The latter two are fine instrumentals. “Carol of the Bells,’” especially, is a deeply satisfying guitar and percussion workout that embraces not only hard rhumba drumming, but funk, Mexican folk music, and screaming blues-rock. Hopefully, their version of “Run Rudolph Run” will make Chuck Berry proud, with its rumbling upright piano and bassline, and Henry’s guitar offering his best modern read of Berry’s instrumental innovation on the I-IV-V progression. But the real highlights here are the two originals that open the set. “I’ve Longed for Christmas” is a bona fide new seasonal tune with its warmth, soulful wah-wah guitar, and laid-back drum kit shuffling around a slippery groove. The brothers sing unfettered joyful harmonies about giving, peace, love, and joy — and the celebration of Christ’s birth. “She’ll Be My Everything for Christmas” is inspired by Fats Domino’s New Orleans brand of rhythm & blues with loose strolls up and down the keyboard and his celebration of love between two people. The relaxed, back to basics approach works well. So if you’re looking for something else to put in your holiday selection, Christmas Spirit is an excellent bet , not only to inspire cheer in yourself, but to delight your guests as well. LLB wants to thank you for the review. I just read it to them and they even gave and a hearty “YES” as you described the record. They want to thank you for “getting it”. Again many many thanks – Merry Christmas and God Bless. Loved to listen to it while making cookies… great job guys.. can’t wait to see you again!